Aging is associated with an increased susceptibility to infectious agents and correlates with a decreased ability to mount an immune response. It has been postulated that the major defect is related to a reduced capacity of an aged T cell to proliferate and to survive after encounter with Ag. This is similar to the phenotype associated with T cell tolerance in young adults. In this study, we determined whether targeting 4-1BB (CD137), a member of the TNFR family implicated in providing expansion and survival signals to T cells, can rescue defective priming in aged and tolerized animals. Agonist Abs to 4-1BB injected in vivo were capable of preventing CD4 T cell tolerance to soluble peptide in young mice. Moreover, anti-4-1BB rescued defective priming of aged TCR transgenic CD4 T cells responding to peptide Ag in a young host, and as importantly, anti-4-1BB completely restored T cell priming to protein Ag in nontransgenic aged mice. These studies demonstrate that 4-1BB, and potentially other costimulatory members of the TNFR family, are targets for therapies aimed at augmenting weak T cell responses in elderly immunocompromised individuals. In the elderly, there is an increase in susceptibility to infectious, neoplastic, and degenerative diseases. This is thought to be due to immune cells becoming less responsive as an individual ages. It has been postulated that the major defect is in the T cell compartment. It may be primarily related to a decrease in the ability of a T cell to proliferate and to survive after Ag encounter (1, 2), and is associated with lowered IL-2 production and reduced IL-2R expression (3). There is an increase in memory T cells with age (4), although both naive and memory T cells present late in life appear to be less responsive than T cells from young individuals (5). Although a great number of alterations in signaling capacity have been described compared with young T cells (6), the mechanisms responsible for the reduced activity of aged T cells are still largely unknown. It is interesting that in many respects the defects reported in aged T cells are similar to those that occur under tolerizing conditions, with striking hyporesponsiveness seen in the ability to proliferate and expand in numbers and in some cases to survive after Ag reencounter. As generation of an efficient T cell response requires coreceptor interactions with APC-expressed costimulatory molecules, and the absence of these second signals results in tolerance, this led us to speculate that defective T cell responses in aged individuals might be amenable to therapeutic interventions that enhance costimulation. It is now clear that a number of costimulatory molecules may be important for a T cell response, not all for the initiation, but some also for its continuation and propagation. In particular, members of the TNFR family have been shown to regulate the extent of clonal expansion and long-term survival of Ag-stimulated T cells (7, 8, 9, 10, 11, 12). Moreover, we recently showed that signaling through one of these molecules could restore normal responsiveness in tolerized animals (13). As the equilibrium between the extent of cell expansion and survival vs death seems to be unbalanced with advancing age, this suggested that the TNFR family might be ideal targets for restoring defective T cell responses. 4-1BB (CD137) is one such member and is expressed on activated but not resting T cells (14). 4-1BB can costimulate both CD4 and CD8 T cells (11, 15), and from several varying systems has been suggested to play an important role in enhancing proliferation and survival (7, 8, 11, 12, 16, 17). Moreover, studies with agonist reagents to 4-1BB have demonstrated significant potentiating effects on weak T cell responses, particularly those elicited against tumors (18, 19). Therefore, in this study we sought to determine whether signaling through 4-1BB could rescue defective T cell responses in aged animals. AND TCR transgenic mice were bred on a B10.BR background (10) and aged to 14–20 mo. B10.BR mice were bred and aged to 18–22 mo. Fourteen-mo-old C57BL/6 mice were purchased from National Institute for Aging (Harlan Sprague-Dawley, Indianapolis, IN) and aged to 20–24 mo, and young C57BL/6 mice (6–8 wk of age) were purchased from The Jackson Laboratory (Bar Harbor, ME). Mice showing gross pathology were excluded. CD4+ T cells were purified from spleen and lymph nodes of aged or young AND TCR transgenics by nylon wool depletion, followed by Ab and C treatment as described (10). The resulting cells were >90% CD4+ T cells, and of these >95% expressed Vβ3/Vα11. APCs were isolated from the spleen of young or old mice by depleting T cells. APCs were irradiated before use. For responses in chimeric transgenic mice, 2.5 - 106 Vβ3/Vα11 CD4 T cells from young (6–8 wk old) or old (14–20 mo) AND transgenic donors were injected i.v. into unirradiated wild-type B10.BR mice (13). Two days later, mice were either immunized s.c. in the base of the tail with 50 μg of peptide 88–103 of moth cytochrome c (MCC)3 emulsified in CFA (Fisher Scientific, Pittsburgh, PA) for aging experiments, or injected i.v. with 500 μg MCC in PBS for tolerance experiments. Two days after peptide injection, mice received 100 μg i.p. of control IgG or agonist anti-4-1BB Ab (3H3; a kind gift from Dr. D. Hollenbaugh, Bristol-Myers Squibb, Princeton, NJ). For assessing the extent of in vivo T cell tolerance, mice were challenged s.c. on day 10 with 50 μg MCC in CFA as previously described (13). For response in aged nontransgenic BL/6 mice, T cell priming was assessed after immunization s.c. at the base of the tail with 100 μg OVA in CFA. For in vitro experiments, purified CD4 T cells (2 × 105 cells/ml) were activated on plates coated with 10 μg/ml of anti-CD3 (BD PharMingen, San Diego, CA) in the presence or absence of anti-CD28 or anti-4-1BB (5 μg/ml). For in vivo experiments, draining lymph node cells (inguinal and periarotic) were stimulated with varying concentrations of MCC peptide or OVA (13). T cells were pulsed with 1 μCi [3H]thymidine (ICN Biochemicals, Irvine, CA) at 60 h and harvested 16 h later. Supernatants were harvested 30–36 h after stimulation to assess production of cytokines (10). T cells were stained with anti-CD4-FITC and anti-CD28-biotin or anti-4-1BB-biotin (BD PharMingen), followed by streptavidin-PE (BD PharMingen). APCs were stained with anti-B220-FITC or anti-CD11c-FITC and 4-1BBL.Fc-biotin followed by streptavidin-PE, or anti-B7-1-PE, anti-B7-2-PE, and anti-CD40-PE (BD PharMingen). Analysis was performed on a BD Biosciences FACSCan with CellQuest software (BD Biosciences, Mountain View, CA). Defective T cell responses associated with aging are in many respects similar to those that are visualized when young adults undergo active tolerization. Experimentally, tolerance can be induced by injection of soluble peptide in the absence of adjuvant, a process thought to be governed by a lack of sufficient costimulation and/or weak signaling through the TCR. To determine whether 4-1BB costimulation could be a candidate for preventing tolerance and thus be useful for augmenting T cell priming in aged individuals, we initially induced tolerance in young adult animals by injection of a peptide of MCC in soluble form that is recognized by CD4 T cells (13). To coincide with expression of 4-1BB, agonist anti-4-1BB (17) or control Ig was injected 2 days after Ag. All mice were challenged with MCC in CFA to monitor development of tolerance in vivo, and T cell priming was assessed in a tertiary exposure to Ag in vitro 1 wk later. As demonstrated previously (13), soluble peptide injection suppressed the induction of a strong CD4 T cell response upon challenge with immunogenic Ag in adjuvant (Fig. 1⇓). Strikingly, anti-4-1BB treatment completely prevented this form of T cell tolerance, as measured by the ability to proliferate or to secrete cytokines to Ag reencounter (Fig. 1⇓). These data directly show that signaling through 4-1BB may be useful to correct defective priming of CD4 T cells in situations where Ag is encountered in a weakly immunogenic form. Our results are similar to those recently published on CTL priming to tumor-derived peptides where agonist anti-4-1BB Ab replaced CD4 T cell help in preventing CD8 T cell tolerance (19). 4-1BB signals prevent T cell tolerance induced by soluble peptide. B10.BR mice were injected i.v. with 500 μg of soluble MCC peptide in PBS to induce T cell tolerance (triangles) and compared with control mice injected with PBS alone (squares). Two days later, mice undergoing tolerization were treated i.p. with 100 μg agonist Ab to 4-1BB (filled symbols) or control IgG (open symbols). After 10 days, all mice were challenged s.c. with an immunogenic dose of 50 μg MCC in CFA. On day 17, draining lymph nodes were isolated and T cell responsiveness assessed in vitro after restimulation with varying doses of MCC. a, Proliferation at 76 h. b, IL-2 production at 36 h. Results are means ± SEM of triplicate cultures using cells pooled from three mice per group. Identical results were seen in one repeat experiment. It has been proposed that the defect in the immune response in aged individuals is mainly due to reduced T cell reactivity. It is not clear whether the ability of APCs to present Ag also contributes to the overall defect. To address the latter, we adoptively transferred CD4 T cells from young or aged Vβ3/Vα11 expressing AND TCR transgenic mice into unirradiated young or aged syngeneic hosts (Fig. 2⇓). Previous studies have shown that the T cells in aged transgenic mice retain a naive phenotype, but still exhibit similar defects to those seen in aged memory phenotype cells (5, 20). All adoptive hosts were immunized with MCC, the peptide recognized by the AND T cells, in CFA (Fig. 2⇓). When T cell reactivity to peptide was assessed in an in vitro secondary response, aged T cells showed reduced responses whether they were activated in young or aged hosts. Similarly, the age of the host did not influence the response from young T cells which was substantially higher than that of aged T cells. These data suggest that APCs in an aged animal are capable of presenting Ag and providing activation signals, and that strategies directly targeting the T cell may prove effective in rescuing the poor response from aged T cells. Deficient priming of aged T cells is not influenced by the host environment. CD4 T cells from young and aged AND TCR transgenic mice (open and closed symbols, respectively) were isolated and adoptively transferred into young or aged B10.BR hosts (squares and triangles, respectively). Mice were immunized with 50 μg MCC in CFA and T cell priming was assessed in lymph node cultures 7 days later. a, Proliferation at 76 h. b, IFN-γ production at 36 h. Results are means ± SEM of triplicate cultures using cells pooled from three mice per group. Identical results were seen in two experiments. There are reports of decreased CD28 expression in aged human CD8 cells (21), and several studies in mice have determined if CD28 signals can rescue defective aged T cell responses. Some positive effects have been seen with exogenous CD28 stimulation, but overall the responsiveness of T cells from aged animals has not been fully restored (1). To initially determine whether 4-1BB could be a target for augmenting responses of aged T cells, CD4 cells from old or young mice were activated and expression of 4-1BB analyzed in comparison to CD28 (Fig. 3⇓). CD28 is constitutive on resting CD4 cells and is up-regulated following activation, whereas 4-1BB is not expressed on resting cells and needs to be induced (14, 15). Activated aged CD4 cells expressed somewhat lower levels of CD28 than young T cells, whereas they expressed similar levels of 4-1BB (Fig. 3⇓a). 4-1BB signals synergize with CD28 signals to promote aged T cell responses in vitro. CD4 T cells were purified from young and aged C57BL/6 mice. a, CD28 expression; and b, 4-1BB expression, after activation in vitro with anti-CD3 for 48 h. c, Proliferation at 76 h induced by activation with combinations of anti-CD3, anti-CD28, and anti-4-1BB. Results are means ± SEM of triplicate cultures. Results are representative of three similar experiments. Purified T cells were then stimulated with plate-bound anti-CD3 in combination with agonist Abs to CD28 or 4-1BB (Fig. 3⇑b). Correlating with other studies (1), anti-CD28 partially enhanced the response from aged CD4 cells but did not reproduce the response of young CD4 cells when costimulated in this way. Anti-CD28 provided maximal costimulatory signals to young T cells in that addition of anti-4-1BB had no further potentiating effect. Anti-4-1BB had little effect on aged T cells in the absence of CD28 signals; however, when combined with anti-CD28, the response was augmented to levels equivalent to young cells (mean increase of 6.3 ± 3.5-fold over anti-CD28 in several separate experiments). To determine whether anti-4-1BB could correct the T cell defect in an intact aged animal, unmanipulated C57BL/6 mice which did not receive transgenic T cells were immunized with an H2b-restricted Ag, OVA, given in CFA (Fig. 4⇓). Activated CD4 cells (forward light scatter (FSC)high, CD44high; presumably largely OVA-specific) expressed 4-1BB 48–72 h after immunization, with levels in young vs aged mice being fairly equivalent (Fig. 4⇓a). Activated dendritic cells (FSChigh, CD11chigh) and B cells (data not shown) in both young and old mice were also phenotypically similar, possessing high levels of B7-2 and CD40 (data not shown) and low levels of B7-1 (Fig. 4⇓b). However, 4-BBL was not detected in either young or aged mice. 4-1BB signals prevent defective T cell priming in aged hosts. Young and aged C57BL/6 mice were primed s.c. with 100 μg OVA in CFA. On day 2, aged mice were treated i.p. with 100 μg of either agonist anti-4-1BB or control IgG. a, 4-1BB expression on activated CD4 cells (gated FSChigh, CD4+, CD44high) on days 1 and 3 in mice receiving control Ig. b, 4-1BBL, B7-1, and B7-2 expression on activated dendritic cells (gated FSChigh, CD11chigh) on day 2 in mice receiving control Ig. Similar expression profiles were seen on day 3 and in B cells (data not shown). c, T cell proliferation to varying doses of OVA in vitro, measured 7 days after immunization. □, Young mice; ▵, aged mice with control Ig; ▴, aged mice with anti-4-1BB. d, IFN-γ secretion with 10 μg/ml OVA, measured 40 h after in vitro stimulation. Results are means ± SEM of triplicate cultures with cells pooled from three mice per group. Similar results were seen in two repeat experiments. As in the young chimeric mice possessing aged transgenic T cells, nontransgenic aged mice exhibited a vastly deficient in vitro recall response compared with young mice when assayed 7 days after immunization (Fig. 4⇑, c and d). In contrast, treatment with anti-4-1BB restored the proliferative and cytokine response of T cells from aged mice such that it was identical with the response in young mice (mean increase in responses of 3.4 ± 0.5-fold at the highest Ag doses in several separate experiments). To determine whether 4-1BB signals could augment the response of aged T cells even in a young environment, chimeric mice were made by adoptively transferring cells from aged AND transgenic mice into young B10.BR hosts. The response of these T cells was compared with that from young T cells after immunization with MCC peptide in CFA in the presence or absence of anti-4-1BB (Fig. 5⇓). Under these priming conditions, anti-4-1BB had little effect on the response of young T cells, most likely reflecting maximal endogenous costimulation provided by the adjuvant action of CFA. As before, young mice with aged T cells showed greatly reduced responses to secondary stimulation with Ag compared with mice with young T cells. In contrast, anti-4-1BB-treated mice possessing aged T cells demonstrated augmented responses that were almost identical with those from mice possessing young T cells (mean increase in proliferation of 4.6 ± 0.6-fold at the highest Ag doses in several separate experiments). Collectively, these data provide compelling evidence that 4-1BB signals can rescue the defect in T cell responses associated with aging. 4-1BB signals rescue defective priming of aged T cells in young hosts. CD4 T cells were purified from young or aged AND TCR transgenic mice and adoptively transferred into young B10.BR hosts. All mice were immunized s.c. with 50 μg MCC in CFA. On day 2, mice receiving aged T cells were treated i.p. with 100 μg of either agonist anti-4-1BB or control IgG. After 7 days, T cell priming was assessed by measuring proliferation to varying doses of MCC in vitro. □, Young T cells; ▪, young T cells with anti-4-1BB; ▵, aged T cells with control Ig; ▴, aged T cells with anti-4-1BB. Results are means ± SEM of triplicate cultures with cells pooled from three mice per group. Similar results were seen in three experiments. It is well-established that advancing age leads to a decline in the ability of the immune system to mount a T cell response to new as well as previously encountered Ags (22). Although it is possible that defects lie at the level of Ag presentation, only a few reports have implied that APC may be defective in stimulatory capacity with old age. Our results with adoptive transfer of young CD4 T cells into aged hosts suggest that aged APCs are capable of effective priming of T cells. Moreover, stimulation of aged T cells in a young host did not enhance Ag-specific priming, arguing that the milieu in an aged animal does not play a significant role in suppressing the response of T cells to Ag challenge. This suggests that in aged individuals, intrinsic defects in the T cell are responsible for hyporesponsiveness (6), and that molecules that positively signal T cells may be targets for therapeutic intervention. The data presented in this study now clearly show that targeting a T cell-expressed membrane molecule, in this case 4-1BB, can synergize in vivo with endogenously produced signals and be effective in overcoming deficient priming of T cells in aged animals. Whether there is one specific defect that contributes to an aged T cell being hyporesponsive is unlikely, and studies over the past 10 years have highlighted multiple potential differences in signal transduction cascades between young and aged cells (6). These include reduced phosphorylation of CD3ζ, reduced calcium signals, reduced c-Jun N-terminal kinase (JNK)and AP-1 activity, and reduced ability to localize signaling intermediates to the immunological synapse. Although our studies conclusively demonstrate that 4-1BB signals can overcome defective priming in aged animals, they do not necessarily imply that a lack of 4-1BB signals to an aged T cell is normally responsible for its hyporesponsiveness. As 4-1BB is minimally expressed in the first 24 h of encountering Ag, after the time when the majority of altered signaling has been reported to occur, it is unlikely that defective provision of 4-1BB signals is a primary cause of the aged phenotype. Rather, we favor the idea proposed by Miller (6) that the ability of an aged T cell to proliferate and survive largely stems from altered TCR-signaling capabilities. In many respects, this is similar to the conclusion gained from studies of tolerance, which have also shown defects in early signaling events in the extracelluar signal-related kinase, JNK, AP-1, and NF-κB pathways (23). However, our studies of 4-1BB do suggest that molecules that either enhance the accumulation of common TCR signaling moieties, or that bypass these pathways, may be ideal targets for overcoming hyporesponsiveness, whether it is brought about by age or through active tolerance mechanisms. Thus, in situations where T cells do not receive sufficient stimulation, either through CD28 or the TCR due to reduced expression or reduced quality of signals, secondary costimulatory molecules can be used to enhance T cell responses. In this regard, we have also recently shown that T cell tolerance can be rescued by providing signals through OX40, a related member of the TNFR family that may share common signaling pathways with 4-1BB (13). At present, there is only a moderate amount of information regarding signals emanating from 4-1BB. It can bind the adaptor proteins TNFR-associated factor (TRAF)1 and TRAF2 (24, 25, 26), can result in activation of NF-κB (24, 25), and may signal pathways leading to JNK and/or p38k activation (27, 28). Similarly, OX40 can bind TRAF2 and TRAF5 and activate NF-κB (24). Thus, it is possible that hyperactivating one or several of these pathways may be the key to rescuing defective T cell responsiveness associated with aging or tolerance. The ultimate effector molecules that may allow aged or tolerized T cells to respond well are unclear. 4-1BB has been shown in several systems to provide antiapoptotic/survival signals, but the molecular basis of this is not known. We recently showed that OX40 mediates survival of T cells in part through an action on Bcl-xL and Bcl-2 (10), and have proposed that 4-1BB may have similar targets (12). 4-1BB signals can also up-regulate IL-2 production in a number of systems (11, 15, 16), and in vitro studies of aged T cells have indicated that exogenous IL-2 can augment their response (20). Thus, both enhancing the expression of antiapoptotic molecules and promoting IL-2 secretion in vivo may play a role in rescuing defective T cell responses. In conclusion, our results in this study with 4-1BB and our prior data with OX40 demonstrate that molecules which normally play a role in the later phase of the immune response can be efficiently targeted to enhance T cell responses under situations where signaling through the TCR or CD28 is either defective or not sufficient. 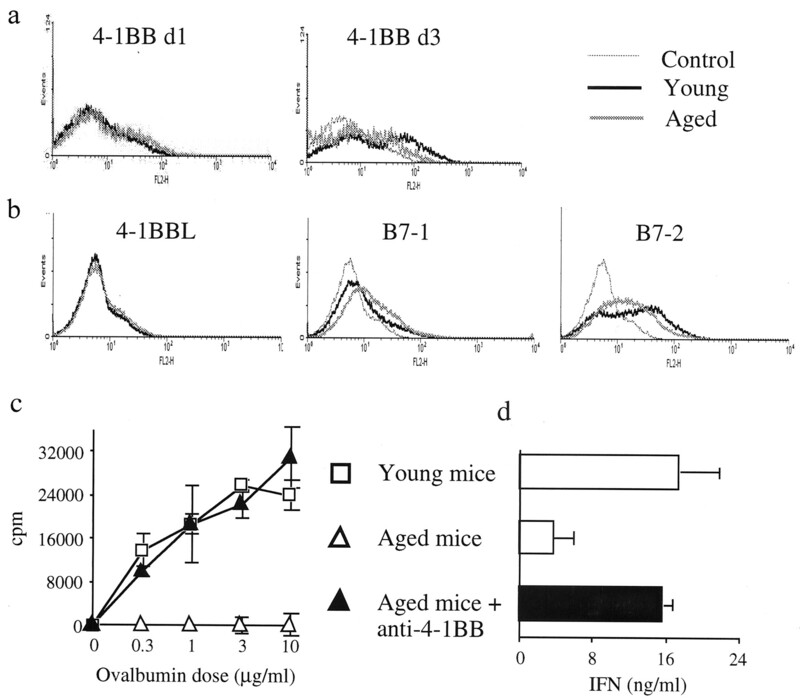 The fact that agonist reagents to 4-1BB can enhance T cell responses in aged animals has important therapeutic implications, because the risk of infections increases dramatically with age. We raise the possibility that in situations where an enhanced immune response is desirable in old individuals, such as in the case of viral infections, treatment with agonist reagents to 4-1BB or other costimulatory members of the TNFR family have the potential to limit the susceptibility to these infections. We thank Dr. Diane Hollenbaugh for providing the Ab to 4-1BB. ↵1 This work was funded by National Institutes of Health Grants AG15638 and AI42944 (to M.C.). ↵3 Abbreviations used in this paper: MCC, moth cytochrome c; FSC, forward light scatter; TRAF, TNFR-associated factor; JNK, c-Jun N-terminal kinase.